I have another portion of this lo mai chee dough and some red bean paste sitting in the fridge need using. 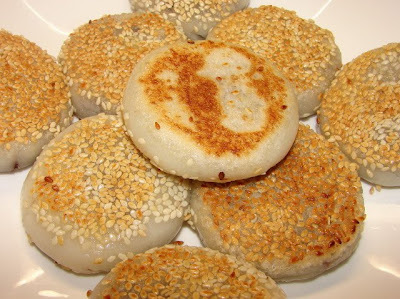 I made some fried soft cakes (dou sa jin yuen bing 豆沙煎軟餅) . If you like jin dui 煎堆 you probably like these little soft and chewy cakes. It has the same taste as jin dui only softer and less oily. Follow the same recipe for lo mai chee up to wrapping and forming the ball. Then gently press the ball to a flat cake, sandwich between both hands. Be careful not the split the edge, try to use gentle fingers pressure from the centre and outwards. 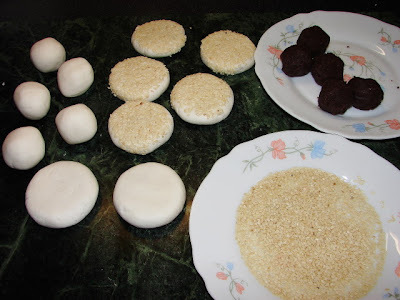 Coat one side of each cake with raw sesame seeds. Pan fried with a little oil, fry the sesame seeds side first for few minutes on medium low heat till golden, flip over and fry the other side to golden and crisp. Thanks Shayma. Noodles are not that difficult, play-doh time for me.